It may be cold outside, but Falcon Pools are enjoying the warm glow of success. Their highly acclaimed, exquisite, luxury pools, stormed the prestigious SPATA British Pool and Spa Awards, held during SPATEX, the UK’s largest dedicated Pool, Spa and Wellness Show. The show is held annually at the Ericsson Exhibition Hall at the Ricoh Arena in Coventry, drawing the attention of companies from across the UK and overseas to exhibit their products and services, network and attend workshops and seminars. The annual industry gala event brings together the trade organisations, BISHTA (British and Irish Spa and Hot Tub Association) and SPATA (Swimming Pool and Allied Trades Association), recognised for their work in setting standards and a Code of Ethics for their members, in a joint event to celebrate the industry’s best examples of design, construction, installation and innovation. The top awards were presented by special guest, Charlie Matthews, from the Wasps Rugby Club. Leading the award winners were Falcons Pools, who have a long-standing reputation for building bespoke swimming pools to the highest standards. 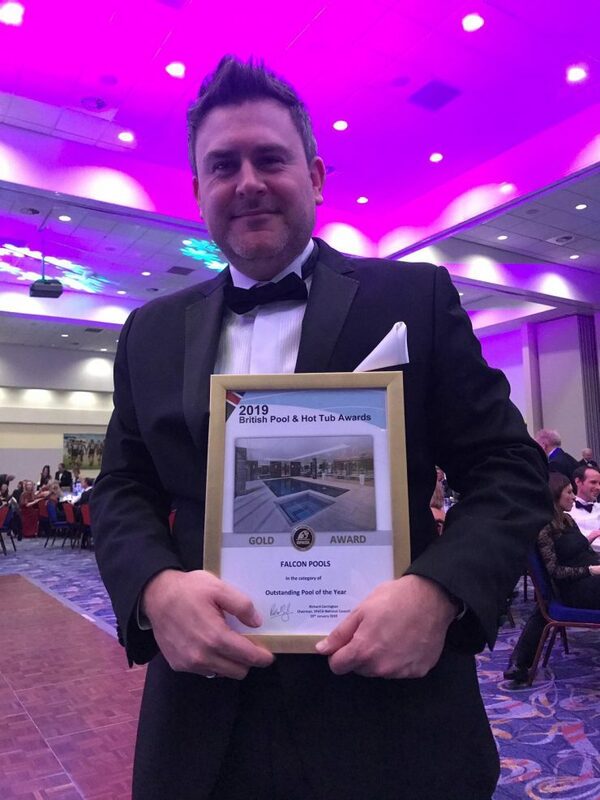 Falcon Pools were delighted to win the elite award of the evening, the Gold prize for ‘Outstanding Pool of the Year’ recognising the Gresham House indoor pool and spa, as the crème de la crème, for its supreme quality, style and opulence. In addition they also won another Gold prize for the same exemplary indoor pool and spa at Gresham House, in the category for ‘Residential Indoor Pools from £125,000 to under £150,000’. And finally a Bronze prize for their stunning, sleek and contemporary outdoor pool in Northwood, for the category for ‘Residential Outdoor pools from £75,000 to under £125,000’. With judging carried out by a group of selected industry experts and consumers, entrants must submit photographic evidence and detailed specifications, on which the judges base their scores. The ‘Outstanding Pool of the Year’ award is judged from all of the Gold winning entries from each category and the judging panel select the overall ‘Outstanding Pool of the Year’ anonymously. The success of Falcon Pools, whose reputation has become synonymous with building bespoke swimming pools to the highest of standards, is evidence of the findings backed by the latest industry research from Wet Leisure Survey, complied by the BSPF and Golden Coast, which found that the luxury pool and spa sector remained buoyant, with customers focused on quality, energy efficiency and the reduced need for chemicals. Receiving their awards at the luxury, black tie event, Falcon Pools were delighted with the recognition of their commitment to quality, service and cutting-edge technology, which has seen them celebrated for their exceptional standards, attention to detail and commitment to the highest levels of service. Falcon Pools success at the British Pool and Hot Tub Awards has made them eligible to be shortlisted for the European Pool and Spa Awards hosted by the European Union of Swimming Pool and Spa Associations. They look forward to delivering these same high standards in 2019 and continuing to lead the industry initiatives that have seen their pools reach the top of their field.